Raspberries macerating in the fridge needed to be used. No time to make and bake a raspberry coffee cake, so I took the quick route and made raspberry shortcakes for breakfast. Have you ever used your food processor to cut shorting into dry ingredients for biscuits? A few pulses and it is done so fast that it is more than worth the little bit of trouble of washing the processor bowl and blade. Best shortcut trick ever! Flour, sugar, baking soda and salt, shortening and milk make the dough. Knead it a few times, roll it out and cut into rounds. I use tomato sauce cans as biscuit cutters and ring molds. How’s that for recycling? 10 minutes in the oven instead of 40 gets it on the table in a hurry. While the shortcakes baked, I hand whipped a bit of heavy cream, added a little sugar, vanilla and orange zest and told the Aussie houseguest it was designer clotted cream. I sectioned the body of the orange and stirred it into the raspberries. Slice the shortcake, add the toppings and dive in! 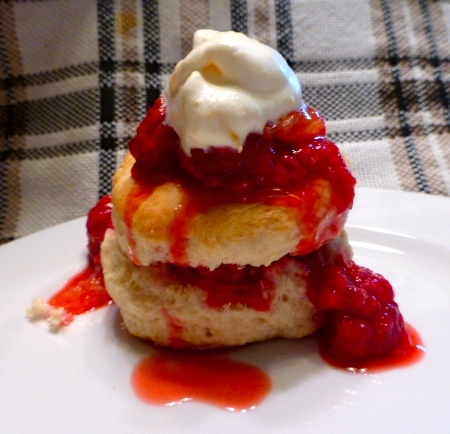 Raspberry orange shortcake with orange clotted cream. Decadent Sunday breakfast, especially if you have more than one. Another triple digit day calling for something light and cool for dinner. Tossed greens, green chile Krab salad stuffed tomatoes hit the spot. Add a few spicy grilled shrimp and dig in! Chile again? Of course, it is chile again, this is El Paso! Weekday breakfast. 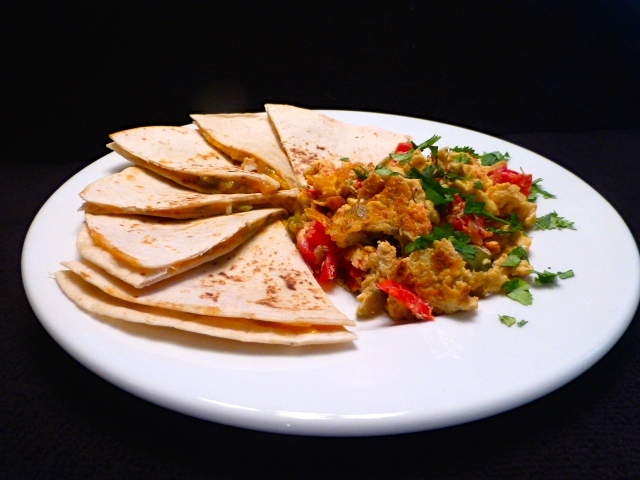 Green chile and cheese quesadillas with scrambled eggs a la Mexicana – tomato, onion and more green chile mixed into scrambled eggs that were allowed a little brown for color. This batch of green chile had enough kick that we didn’t need to add jarred salsa on the quesadillas. Dave, our friend visiting from Australia, is enjoying new dining experiences… Popeye’s, Taco Bell, Blake’s, etc. I had to show him another side of the menu. He’d never had fish tacos, so we had to have a go at it. Pan grilled tilapia seasoned with salt, pepper, ground ancho chiles and comino (cumin) and toped with homemade peach salsa and a little shredded cabbage for crunch. Orange, jicama and nopalito salad and Sarah Rich’s pan roasted Mexican corn slathered in yogurt and toped with melted feta and a dusting of chile lime powder. Not San Diego street food, but pretty close for El Paso! Special Treat for a Sunday Night. Picked up a bunch of really tiny baby beets at the farmers market. I roasted them; next time, I’ll boil them! Delicious, but very hard to peel. I’ll look for some a little bit bigger next time. The roasted beets and crumbles of feta were sprinkled over a bed of baby spinach and arugula tossed in a light Italian dressing. On the side, the beet greens were finished with a little onion and salt pork and a splash of white wine vinegar. One inch potatoes, first boiled and then halved and finished on the grill were the starch for the dinner. The star of the plate was grilled rack of lamb seasoned with lemon juice and dried oregano with a sprinkle of garlic powder. Rack of lamb on the grill over indirect heat. 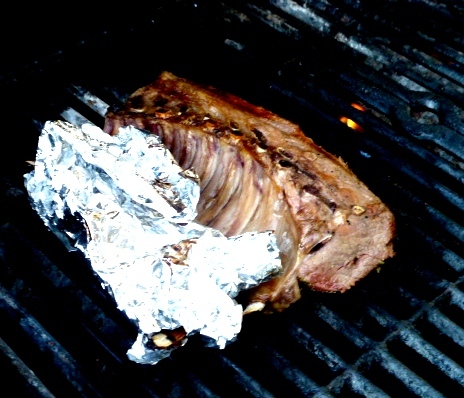 Foil wrap keeps the Frenched bones from burning. 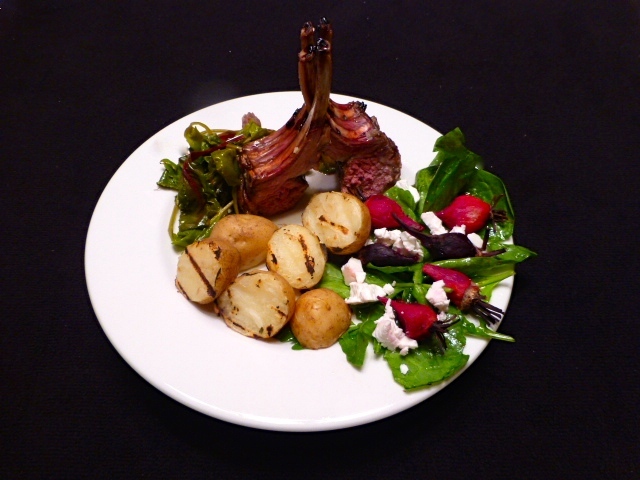 As colorful as it was delicious, from 11:00 o’clock, beet greens sautéed with onion and salt pork; grilled rack of lamb, baby beet and feta salad and grill-finished potatoes. What do you serve with a Trader Jose Dark? Steak Tampiquena, of course. With the drought in the west impacting cattle production, I find meat cuts getting thinner and thinner. I picked up a pack of two thin cut rib eyes weighing a whole 7 oz. One was not quite enough, so, I decided to serve them double decker style. A couple of roasted green chiles were spread over the bottom cut. Then the top one got more green chiles, grilled tomato and grilled onion. On the side, Mexican style fruit salad – melon, pineapple and coconut with a squirt of lime juice and a sprinkle of red chile power. Peeking out from behind is a mix of beans, corn and tomatoes. It was a little breezy on the patio but dining among the shrubs in the back yard is always good. 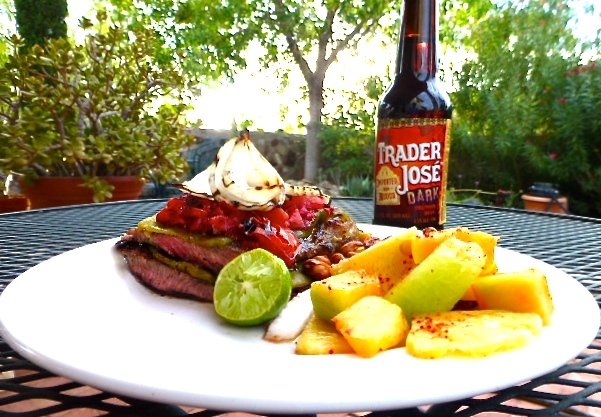 What better to wash down this riff on Steak Tampiquena than a cold Trader Jose dark beer imported from Mexico by Trader Joe’s? Even if it is 225 miles to the Trader Joe’s in Albquerque, the beer is worth the trip! Short ribs. Irresistible in the used meat bin! Errands to run. I put them in the crock pot with a little beef broth. My first yellow pattypan squash from the Farmers’ Market was waiting. So was one lonely little potato. While the grill heated, I microwaved the potato and threw pinto beans, corn, chopped green chile and a chopped fresh tomato into a pot with a splash of chicken broth. I sliced the squash and halved the potato and put them on the grill – just a moment for the potato to give it a little color and a crisp skin. When the squash was nearly done, the ribs went on the grill to be slathered in Julio’s barbecue sauce. 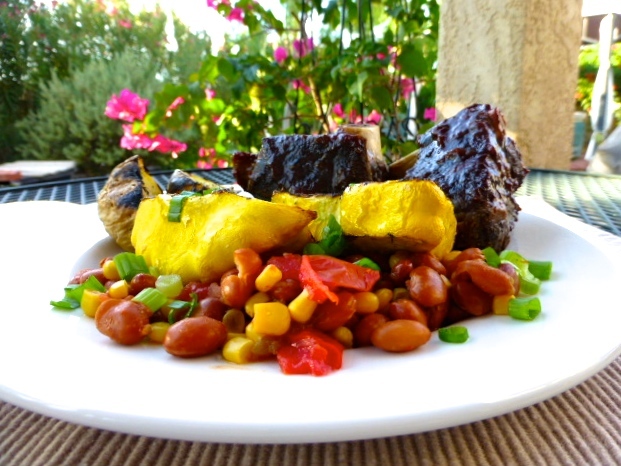 Beans and corn topped with the squash and a sprinkle of green onion, a dab of butter on the potato halves and succulent short ribs made a down home good supper. Bougainvillea blossoms and greenery in the background made it look a little cooler than the 90 degree evening. Saturday, the Master Gardeners had a just-harvested bin of kennebeck potatoes at the Farmers’ Market. I picked out a pound of tiny 3/4 inch diameter beauties. Kennebecks do well in our alkaline soils and spring temperatures. They are firm textured and very flavorful. Since the potatoes were tiny, I decided to make a deconstructed potato salad using a dressing of tiny traditional ingredients such as cornichon (tiny pickles), snips of young chive stems, finely sliced top end stalks of celery, and diced pimento in a dressing of mayonnaise kicked up with a couple of shots of white wine vinegar to balance the sweetness of the mayo. I like hard boiled egg in potato salad. Quail eggs would have been perfect, but have you ever tried to find quail eggs in west El Paso? Maybe one of the asian groceries in the northeast might have them, but I was out of luck. Instead of tiny eggs, I used sliced chicken eggs partnered with grilled romaine lettuce leaves as foundation of color for the salad. Yes, grilled lettuce. It takes a few seconds on the barbecue to wilt the lettuce and get a little char on the edges. 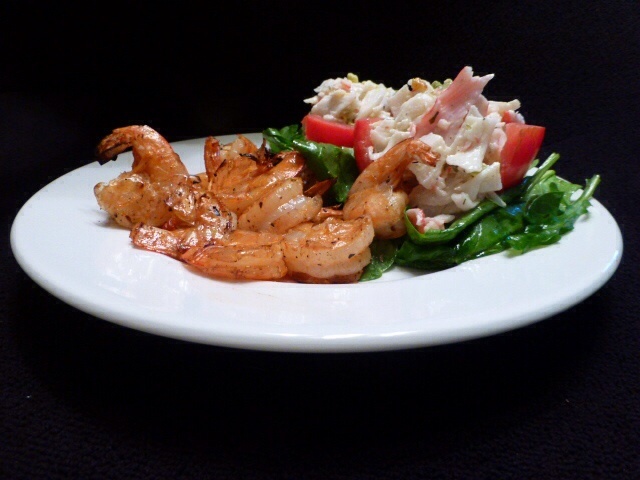 It is very tasty and dramatic on the plate. 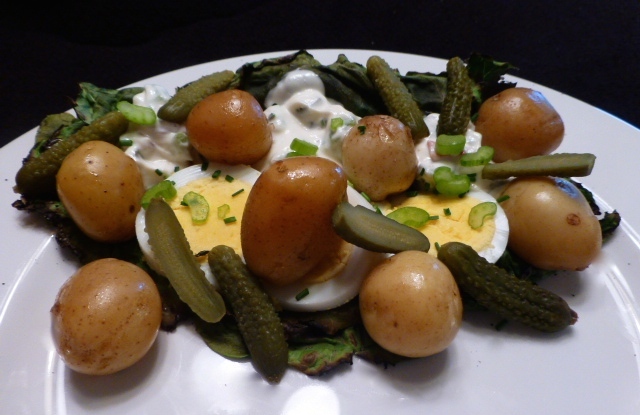 Deconstructed Mini-Potato Salad. 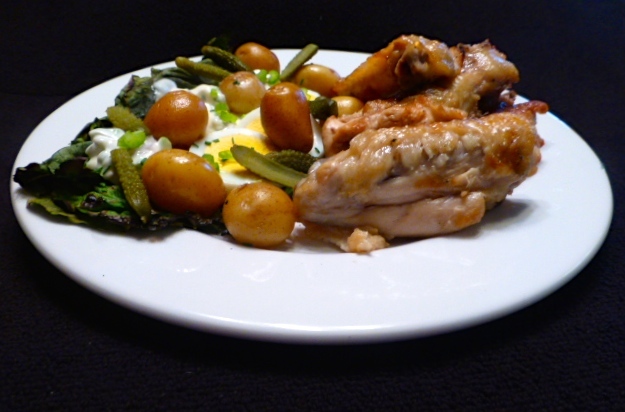 A base of grilled romaine, a foundation layer of sliced egg for color and flavor, scattered tiny potatoes, sliced cornichon and garnish of chopped celery and chives. 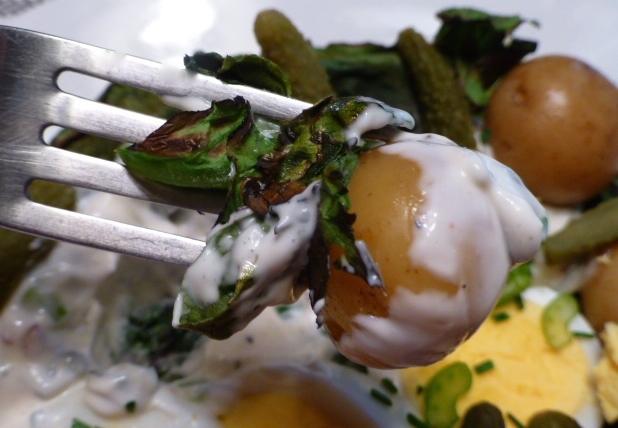 Puddles of mayonnaise and vinegar dressing are for dipping the tiny vegetables. Perspective: one of the tiny potatoes and grilled lettuce on a regular dinner fork and dipped in the tangy dressing. What to serve with my potato salad? Chicken of course! I made a batch of our house favorite vinegar and salt wings. I boil my wings for 15 minutes , drain them and marinate them for at least a half hour in apple cider vinegar and a sprinkling of kosher salt. Next, take them out of the marinade and let them dry for a moment, then toss them in a scant sprinkle of Mediterranean blend oil and put them on a hot grill to pick up a little color. I get some grill marks over direct heat, then move them to indirect heat to let the oil heat up and add a little color and crispness. They are not quite as crisp as friend wings, but much more healthy and less messy to make. When the wings come off the grill, I give them another toss in fresh vinegar (not the marinade) and one last light sprinkle of kosher salt. All this dinner of potato salad and chicken wings needed was a checkered table cloth and lots of napkins! Cold beer made up for the lack of a checkered table cloth. It’s Great to Have Friends Who Know the Best Chefs!!! My friends Darryl and Susan have a wonderful daughter, Sarah, and son-in-law, Evan, who are c0-chefs and owners of Rich Table in San Francisco. When the family gets together, amazing things happen in the kitchen. 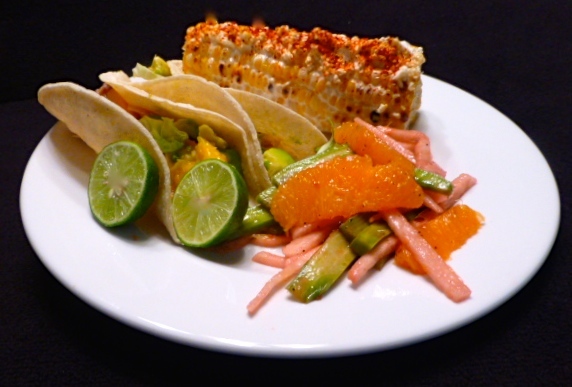 Here’s something I had to try – Sarah’s Mexican Corn. 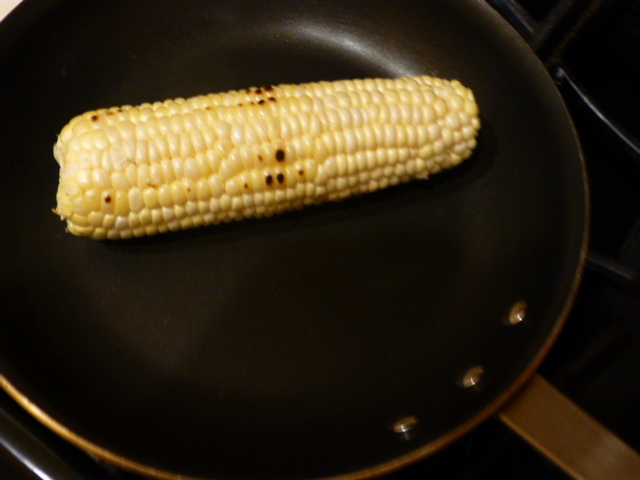 Cook and lightly char fresh corn in a dry hot pan. 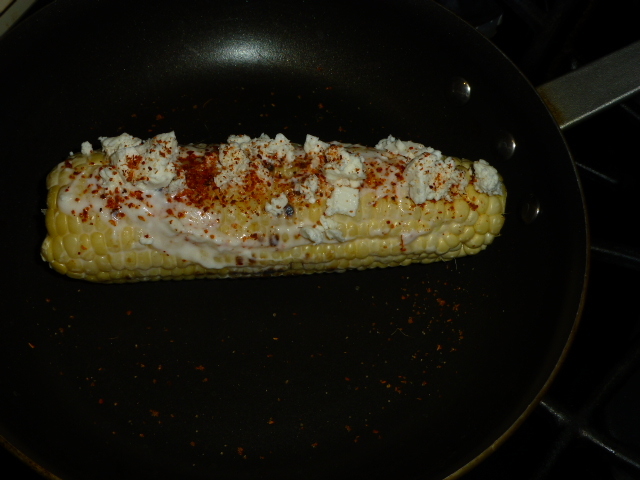 Slather corn with Greek Yogurt, sprinkle with queso fresca or feta cheese and a chile/lime seasoning. I happened to have feta in the fridge. Transfer to a 375F oven for about three minutes to melt the cheese. 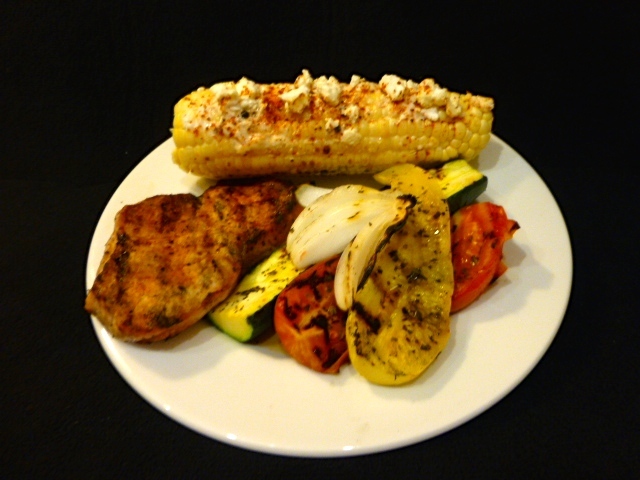 I served the corn with a grilled pork loin chop rubbed with that same chile/lime seasoning and grilled squash, onion and tomato with Italian seasoning. Thank you Darryl and Sarah for sharing this idea. It is a keeper. Four simple ingredients: smokey flavored Lapsang Souchong tea, kosher salt, granulated sugar and tincture of time make a wonderful “smoked” salmon. It takes 8 – 12 hours in the fridge and it is ready to rinse off the cure ingredients, shave and enjoy. 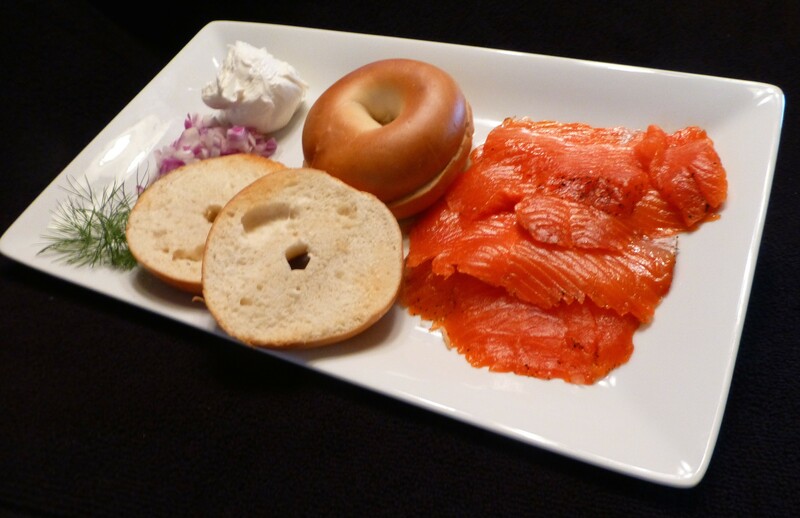 For breakfast, I served it with a couple of lightly toasted mini-bagles, a schmear of cream cheese and sprinkles of red onion and dill. Heck with the V-8 Juice, I should have had a Bloody Mary to make this a perfect breakfast!